Colebridge Trust and Enterprises feature as one of three charities on Love Brum this month. The site can be accessed via here – please do look at the video and vote to help us win some much needed funding. LoveBrum is a charity that engages with local people and businesses to build an even better Birmingham. We shine a light on hidden projects and charities doing good in the city. LoveBrum supporters vote on live projects and everyone has a say in which projects are supported, meaning all funds raised help to boost the local charitable economy and the best part is, every penny raised from individual memberships and fundraising goes straight to the causes. Members of Made in the Midlands have been recognised for their enthusiastic support for the organisation’s Inclusivity Campaign. Twelve companies were invited to attend a reception at the House of Lords where they were the recipients of the inaugural Inclusivity awards. Accompanying them to Westminster were eight companies from sister network, Made in Yorkshire, who have also been supporting the campaign during its first full year. The Midlands companies recognised were: Alphadrive Engineering, Arlington Industries, B Hepworth, Boneham & Turner, C Brandauer, Colebridge Enterprises, Direct Air, FBC Manby Bowdler, GKN Driveline, Mapal, Schmolz & Bickenbach and Wrekin Sheetmetal. We like to give people a second chance by providing them with meaningful employment. Hazel Blears MP has decided she will not run for parliament at the 2015 election so she clearly needs another job. She visited Colebridge Enterprises Assembly Operation recently so we could try her out. She did OK. It seems she started out sticking the labels on Imperial Leather soap. Made her CV look better at least. We haven’t decided yet if we will take her on. The competition for jobs here is fierce. It’s 5:00pm on Friday 13 February. I’m sitting here going through our Key Performance Indicators and thinking I should probably be rushing around the shops trying to buy the last withered bunch of flowers for valentines day tomorrow. I’ve added up the sums and overjoyed to discover we have just passed the 4 MILLION mark for the number of car parts we have stuck labels on, folded, taped and stuck in boxes since we started this roller coaster ride at Colebridge Enterprises just over 2 years ago. And there is another 20,000 or so waiting for our brilliant workers to get stuck into on Monday. Blood, sweat, tears, laughter, stress, frustration, joy, bad singing and hefty sugar rations were all involved. Shedding another little tear as I type. Just hope the petrol station can bail me out on the valentine front. A report just issued by KPMG, ‘A New Vision of Value’, has observed that there is a growing connection between the creation of corporate value (profit & shareholder dividends) and social value (community benefit). The connection is being driven by government strategy, legislation and consumer & voter pressure. Simply focussing on the pound notes on the bottom of the P&L account is no longer enough. For the past couple of years, the public sector has been legally obliged, under the Social Value Act, to consider local social, environmental and economic value in contracts for services over the EU Threshold of €134,000. However, every single local authority in the West Midlands has elected to apply the act to all goods and services they purchase whatever their value. Every local authority in the region now has a ‘Social Value Champion’ in its commissioning & procurement teams. Some public sector bodies are going further by asking about social value within second tier and sub contract arrangements. Whilst the Social Value Act doesn’t (yet) apply to private companies, some of the big players are beginning to see the Act as a tool to create added value and support their Corporate Social Responsibility (CSR) objectives. The UK government is, at this moment, conducting a review of the Act and its application. Possibly seeing it as a vote winner? Global economic crisis, questionable tax avoidance schemes and the overall competitiveness of the market place are factors encouraging consumers to ask questions they never asked before. Social media is fuelling the fire of consumer pressure. When lower unemployment figures were recently announced for the Midlands, who did the BBC Midlands News turn to for comment in its 3 main bulletins on the day? The School for Social Entrepreneurs. Birmingham & Coventry are already shaping up to become the next ‘Social Enterprise’ cities. The Black Country already has a thriving social enterprise zone. Birmingham has a bigger vision – to become the CSR capital of the world! Social Enterprises make great PR because they add that vital human interest angle the media loves. Very simply, it is a business. It’s a business that exists to meet a social or environmental need. It’s a business that re-invests its profits back into the community rather than for personal gain or distribution to a smaller shareholder group. Colebridge Enterprises is a social enterprise providing a light assembly and packing outsource service to manufacturing companies. We process close to 2 million parts a year. Every part delivered on time and 99.98% right first time quality (100% in the past 6 months). In doing this, we provide employment and apprenticeships to young or disadvantaged people with 50% of their labour force being people with mild to moderate learning disabilities. Profits are used to guide other local charities and voluntary organisation to deliver better services. They hold ISO 9001 certification. Colebridge Enterprises has a very simple ethos – “Do good work and be nice”. The rest follows. Increase employee and stakeholder value. We are delighted to have picked up an award at the annual Social Enterprise West Midlands 2013 awards ceremony on Thursday 14 November 2013. The event marks national Social Enterprise day which falls on 21 November. We were ‘Highly Commended’ in the SE Profit category as “a social enterprise committed to growth”. Over 70 organisations were nominated in this years awards so it was very pleasing to pick up an award amongst such impressive competition. Congratulations go to Aidem Digital who took first prize. 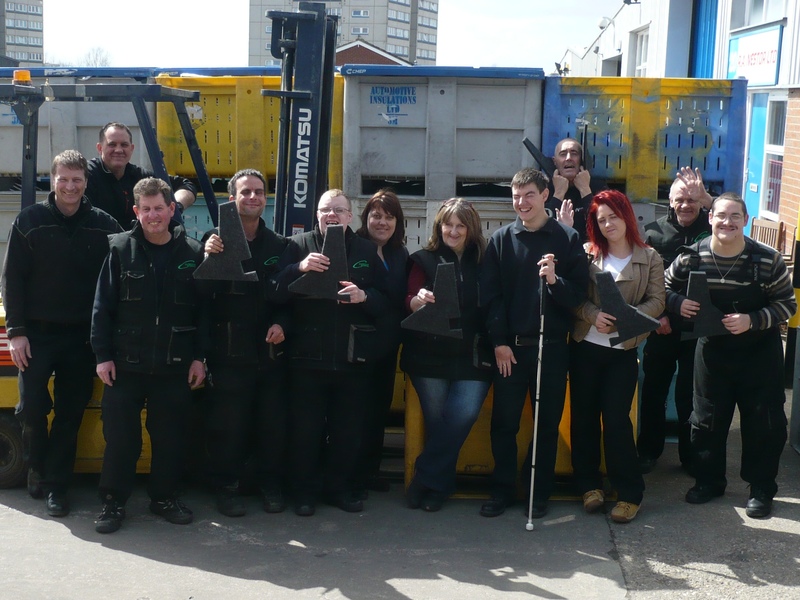 Adults with learning disabilities who previously went to Waterloo Woodwork’s industrial unit in Chelmsley Wood to gain work experience and training are now finding things much better assembling parts. They now have paid jobs for the first time and satisfaction from knowing they are doing a brilliant job. Since the assembly operation started last October, they have processed a million parts for a leading Midlands automotive supplier. 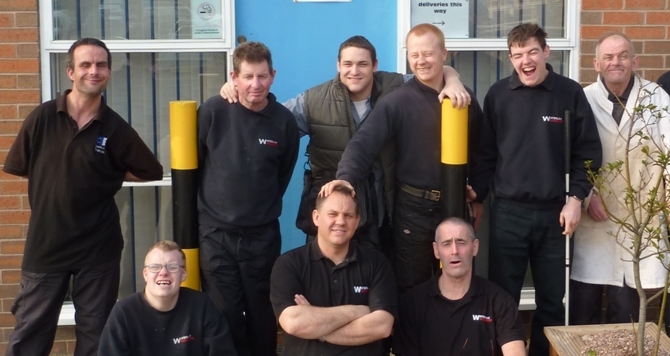 The Colebridge Trust has created 9 new jobs at its industrial unit in Chelmsley Wood with most of those going to adults with a learning disability. The opportunity came about when Charles Rapson, Enterprise Manager at The Colebridge Trust met Jim Griffin, MD of Automotive Insulations (AI) at Aston Business School where both had enrolled on the Goldman Sachs 10K Small Business Growth Programme.